You may be thinking, "Dickens Fair is in December, so long away!" and you would be right, but it never hurts to plan. We're making a lot of changes to the business of American Duchess / Royal Vintage this year, and one of them is attending more events. So far on the remaining 2016 calendar we have a trip to Oakland/San Francisco, Costume College in LA, Rufflecon in Connecticut, and Dickens Fair in San Francisco at year's end. What to wear, what to wear? With Dickens, it's period-specific to c. 1830s - 1860s; place-specific to London, UK; and season-specific to Christmastime. A Victorian Summer dress just won't do! As it happens, I acquired an obnoxious plaid silk that is perfect for Dickens, where obnoxious plaids are all part of the fun. It's primarily royal blue, but it's striped with yellow and fuschia, and just screams 1830s to me. With a tremendously wacky hat and a fun little chemisette, I'm already getting excited just musing on it. The challenge will be in that I don't have as much yardage as I would like, so the ridiculously fun gigot sleeves may not be a possibility (they really do take an extraordinary amount of fabric!). Gigot sleeves were popular for such a very brief period, though they became the iconic look of all the 1830s. The later part of decade still had some pretty interesting things going on with sleeves too, in various places and of varying sizes. Looking forward to seeing this come together! The 1830s are such a fun wackadoodle period. Have you seen this week's Rate the Dress on the Dreamstress's blog? It's a bright red dress from 1837. You might want to consider that too. I love that dress and made it for our 1830s events (Texian Revolution) here in Texas 2 years ago! Wore it to the Texas Independence day celebration at Washington on the Brazos. 1830s is a great period, easy to travel in a car while wearing it. Sent you a photo of me with it on. If not enough fabric for 1830s sleeves, Vivien and I have been visiting Dickens on the same day in silk plaids. Closer to 1850s. 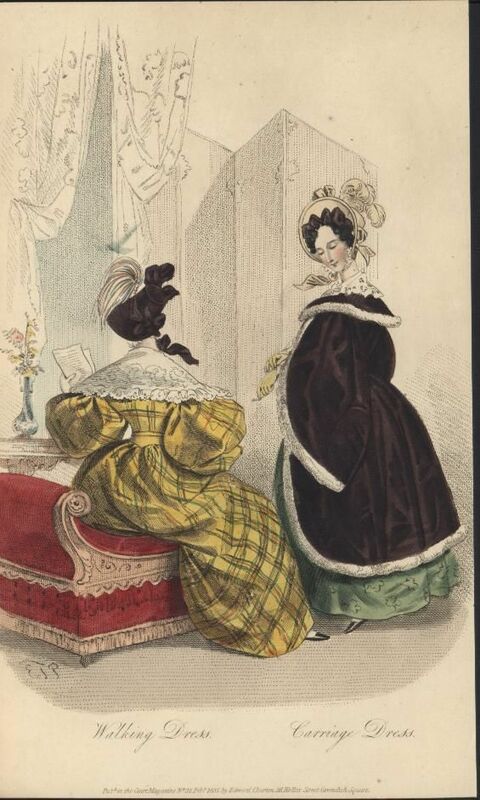 Of course, there are more epic hairstyles and giant bonnets to go over them in the 1830s. Forgot to say, I cannot wait to see YOUR dress because your work is always amazing! 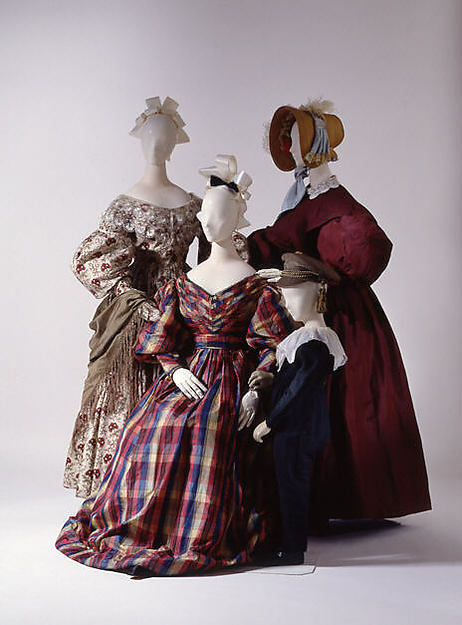 Things I love: Obnoxious plaids, obnoxiously large 1830s sleeves. Can't wait to see it! It sounds like it will be lovely- I can't wait to see what you come up with! Lauren, I think you would look fabulous in that dress from the Met. I would love to see the plaid you have for your dress.